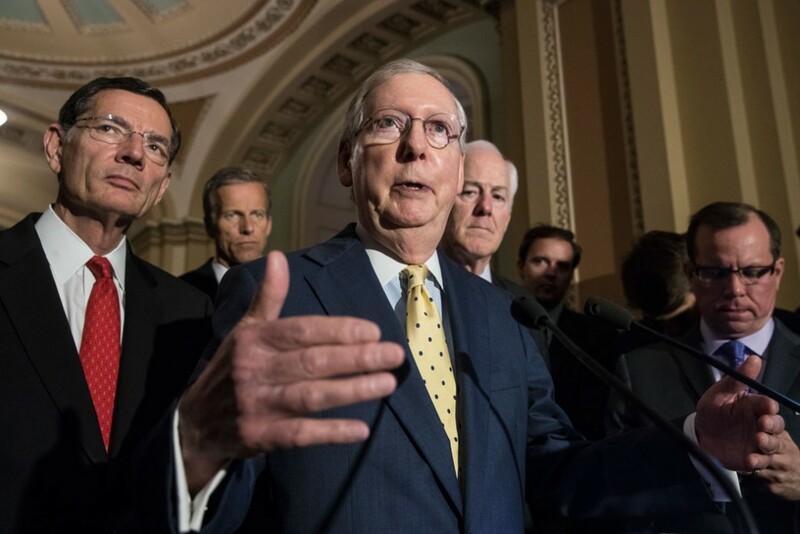 The Congressional Budget Office (CBO) has released its score of the Senate’s health care repeal plan, showing that the bill would eliminate coverage for 15 million Americans next year and for 22 million by 2026. The CBO projects that the Senate bill would slash Medicaid funding by $772 billion over the next decade; increase individual market premiums by 20 percent next year; and make comprehensive coverage “extremely expensive” in some markets. The score, released by Congress’ nonpartisan budget agency, comes amid an otherwise secretive process of drafting and dealmaking by Senate Republicans. Unlike the Senate’s consideration of the Affordable Care Act (ACA), which involved dozens of public hearings and roundtables plus weeks of debate, Senate Republican leadership released the first public draft of its Better Care Reconciliation Act (BCRA) just days before it hopes to hold a vote. The Center for American Progress has estimated how many Americans would lose coverage by state and congressional district based on the CBO’s projections. By 2026, on average, about 50,500 fewer people will have coverage in each congressional district. Table 1 provides estimates by state, and a spreadsheet of estimates by state and district can be downloaded at the end of this column. The coverage losses under the BCRA would be concentrated in the Medicaid program, but the level of private coverage would also drop compared to the current law. The CBO projects that, by 2026, there will be 15 million fewer people with Medicaid coverage and 7 million fewer with individual market coverage. Our Medicaid numbers reflect that states that have expanded their programs under the ACA would see federal funding drop starting in 2021 and that the bill would discourage expansion among states that would otherwise have done so in the future. Like the House’s repeal bill, the Senate’s version contains a provision allowing states to waive the requirement that plans cover essential health benefits (EHB). The CBO predicts that half of the population would live in waiver states under the Senate bill. The CBO did not specify which states it believes are most likely to secure waivers; therefore, we did not impose any assumptions about which individual states would receive waivers in our estimates. Even though the demographic composition of coverage losses would differ among waiver and nonwaiver states, for this analysis we assume that all states’ individual markets would shrink. CBO expects that state waivers could put coverage for maternity care, mental health care, and high-cost prescription drugs “at risk.” CBO projects that “all insurance in the nongroup market would become very expensive for at least a short period of time for a small fraction of the population residing in areas in which states’ implementation of waivers with major changes caused market disruption.” Note that health insurance experts have noted that in addition to directly lowering standards for individual market coverage, waivers would also indirectly subject people in employer coverage to annual and lifetime limits on benefits. The CBO’s score lists multiple reasons why out-of-pocket costs for individual market enrollees would rise under the bill. One reason is that bill’s changes to premium subsidies means that most people would end up buying coverage resembling bronze-level plans, which today typically have annual deductibles of $6,000. In addition, EHB waivers would force enrollees who could not afford supplemental coverage for non-covered benefits out of pocket while also allowing issuers to set limits on coverage. In summary, the CBO projects that the effects of the Senate bill would be largely similar to those of the house bill: tens of millions of people would no longer have coverage, and those who remained insured see the quality of their coverage erode substantially. In just a few days, the Senate will vote to turn these dire projections into reality. Our estimates of coverage reductions follow the same methodology we used previously for the House’s health care repeal bill. We combine the CBO’s projected national net effects of the House-passed bill on coverage with state and local data from the Kaiser Family Foundation, the American Community Survey from the U.S. Census, and administrative data from the Centers for Medicare & Medicaid Services (CMS). Florida, North Carolina, and Virginia redrew their district boundaries prior to the 2016 elections. While the rest of our data uses census estimates corresponding to congressional districts for the 114th Congress, we instead used county-level data from the 2015 five-year American Community Survey to determine the geographic distribution of the population by insurance type in these three states. We matched county data to congressional districts for the 115th Congress using a geographic crosswalk file provided by the Kaiser Family Foundation. Our estimates of reductions in Medicaid by district required a number of assumptions. CBO projected that a total 15 million fewer people would have Medicaid coverage by 2026 under the Senate bill: 5 million fewer would be covered by additional Medicaid expansion in new states, and 10 million fewer would have Medicaid coverage in current expansion states and among pre-ACA eligibility groups in all states. The CBO projected that, under the ACA, additional Medicaid expansion would increase the proportion of the newly eligible population residing in expansion states from 50 percent to 80 percent by 2026. It projected that just 30 percent of the newly eligible population would be in expansion states. Extrapolating from the CBO’s numbers, we estimate the Senate bill results in a Medicaid coverage reduction of 3.3 million enrollees in current expansion states by 2026. We then assume the remaining 6.7 million people who would lose Medicaid coverage are from the program’s pre-ACA eligibility categories: low-income adults, low-income children, the aged, and disabled individuals. We used enrollment tables published by the Medicaid and CHIP Payment Access Commission (MACPAC) to determine total state enrollment and each eligibility category’s share of the total, and we assumed that only some of the disabled were nonelderly. We then divided state totals among districts according to each’s Medicaid enrollment in the American Community Survey. Because each of the major nonexpansion categories is subject to per capita caps under the bill, we reduced enrollment in all by the same percentage. Because we do not know which individual states would participate in Medicaid expansion in 2026 in either scenario, our estimates give nonexpansion states the average effect of forgone expansion and all expansion states the average effect of rolling back eligibility. We divided the 5 million enrollment reduction due to forgone expansion among nonexpansion states’ districts proportionally by the number of low-income uninsured. We made each expansion state’s share of that 3.3 million proportional to its Medicaid expansion enrollment in its most recent CMS report and then allocated state totals to districts proportional to the increase in nonelderly adult enrollment between 2013 and 2015. For Louisiana, which recently expanded Medicaid, we took our statewide total from state data and allocated to districts by the number of low-income uninsured adults. Lastly, our estimates of the reduction in exchange, the Basic Health Plan, and other nongroup coverage are proportional to the Kaiser Family Foundation’s estimates of exchange enrollment by congressional district. The House bill reduces enrollment in nongroup coverage, including the exchanges, by 7 million relative to the ACA. To apportion this coverage loss among congressional districts, we assumed that the coverage losses would be largest in areas with higher ACA exchange enrollment and in states where we estimated the average cost per enrollee would increase most under an earlier version of the AHCA. The CBO projects that the net reduction in coverage for the two categories of employer-sponsored insurance and “other coverage” would be between zero and 500,000 people in 2026. We did not include these categories in our estimates. Emily Gee is a health economist at the Center for American Progress.